The most wonderful and merry time of the year is here. 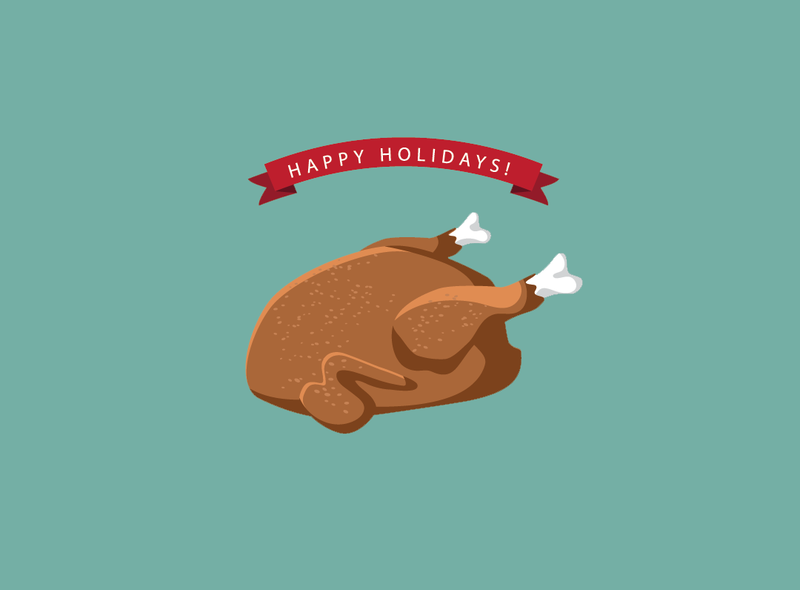 From basting turkeys to ringing sleigh bells and dreaming of red-nosed reindeer, it’s time for work to slow down and spending some quality time with your nearest and dearest. With Thanksgiving officially kicking off the holiday season today, your to-do list is probably full of travel, family plans, eating and shopping. However, trying to keep up with all of those things can also turn the holidays into one of the most stressful time of the year. Whether it’s navigating through airports or the inevitable dinner table argument, the slightest thing can get in the way of a happy holiday season. Luckily, it’s not just your news feed that can give you a little relief during the moments your holiday season seems to be sinking faster than the Titanic. To make sure you’re more than ready to weather the winter holiday storm, here are some tools to help you breathe easy and simply enjoy the month. Over 46m Americans are expected to travel this Thanksgiving weekend, which means long airport lines. Through crowd-sourced updates, MiFlight allows travelers to estimate current wait times at airport security. The app also offers maps to over 70terminal. Waze is the world’s largest community-based traffic and navigation app. Simply enter your destination, and it’ll give you turn-by-turn instructions with real-time updates on traffic and road conditions. If there’s a faster route, Waze will let you know and update your directions. You can get road alerts along your route and check out the cheapest gas prices, as shared by other users. You can alert other drivers about traffic jams, road hazards or speed traps as well. Plus, you can add friends, send locations and keep others posted on your arrival time. With more than 250,000 recipes, BigOven includes great recipe management features. The app also includes a menu-planning calendar and shopping list. The recipe scan feature allows users to upload pictures of handwritten or typed recipes and BigOven automatically transcribes and saves them. Tired of boring leftover turkey sandwiches? Just input whatever food you have left and BigOven will suggest some recipes. Save holiday dinner — and your sanity — with Spotify’s perfectly timed turkey-cooking playlist. This playlist doubles as a turkey timer too. It’s based on the USDA’s roasting timetable, so just choose how much your bird weighs and whether it’s stuffed or not, then the playlist will see you through until dinner’s ready. Forgot an ingredient? Magic lets you order just about anything via text message. With operators standing by 24/7, it will find what you want and get it to you as fast as possible… Like magic. Keep the uncle who knows it all in check with a definitive source for instant expert knowledge. The WolframAlpha database is loaded with information about math, science, geography, music, art, history and more. The ultimate in-ear monitor, Ultimate Ears, allows you to hear only the notes and nuances that you want. When you need to cancel out all the holiday noise, these custom-made earphones will give you solace. Perfect for anyone who’s fond of selective listening anyway. The only thing worse than buying someone the wrong gift is not being able to return it. Returnguru keeps track of your purchases and organizes the receipts by their return policies. All you have to do is take a photo of the receipt when you buy something and it will remind you in advance of the time running out for returns. Do you need a vacation from your vacation? With the largest selection of private islands for sale and for rent, the site allows you to browse through listings from all over the world. Whether you’re looking for a fully-staffed island rental or a barebones plot of land, be assured that Islands for Rent can help you escape. Too tired to move after the dinner? Thanksgiving and football go together like turkey and stuffing. In fact, nothing really soothes a coma-induced meal like it. For the sports enthusiasts, stay on top of the hottest fantasy sports hottest fantasy sports news with Index.co. Read next: Is adblocking pro-consumer, the end of free content… or both?